Built in 1962, this was the second cabin on the land in Romero Canyon homesteaded in the early 1920s by Norman C. Winkler. It burned to the ground in the 2,183 acre Castaic fire of Aug. 27, 2001. World War I veteran Norman C. Winkler homesteaded roughly 350 acres at the top of Romero Canyon in 1920, and proved it up in 1921 with a 900-square-foot cabin, a chicken farm and more than 200 eucalyptus, cedar and pine trees. Witnesses to his homestead application were members of the Romero and Sloan families. Winkler lived in Glendale after his 1919 discharge from the Army and worked at a garment factory in Los Angeles. It's unclear when he moved onto his Romero Canyon property; according to his daughter Marylynn (born June 7, 1933), the family — Norman, wife Mary, and Marylynn — moved into the cabin in 1935. Marylynn was followed by a second daughter, Barbara. Winkler kept 3,000 chickens on the property and derived his primary income from selling eggs, chiefly to Potters Milling Co. on Spruce Street in Newhall, which later became Newhall Lumber. (The street name became San Fernando Road, then Railroad Avenue). Winkler eventually went to work for Bermite Powder Co. in Saugus and scaled back the chicken ranch. In the 1950s, around the time Winkler started an 11-year stint as the Newhall School District's head janitor, his invalid brother, Clifford Winkler, moved into the tiny cabin. In 1962 Winkler built a second cabin for the family, using lumber and glass from a razed building at Newhall Avenue and Market Street, while Clifford stayed in the original cabin. Norman Winkler started selling off property in the 1960s, some to his sister Ruth and her husband, Peter Veir, and continued to live in the new cabin until his death in 1977. The following year, his brother Clifford died when the original 1921 cabin burned down while he was inside it. Marylynn, who became Marylynn Butters, held onto the final four acres until 1999 when she sold it to local attorney James Gilmartin. The property had been unused and its cabin unoccupied since 1994. 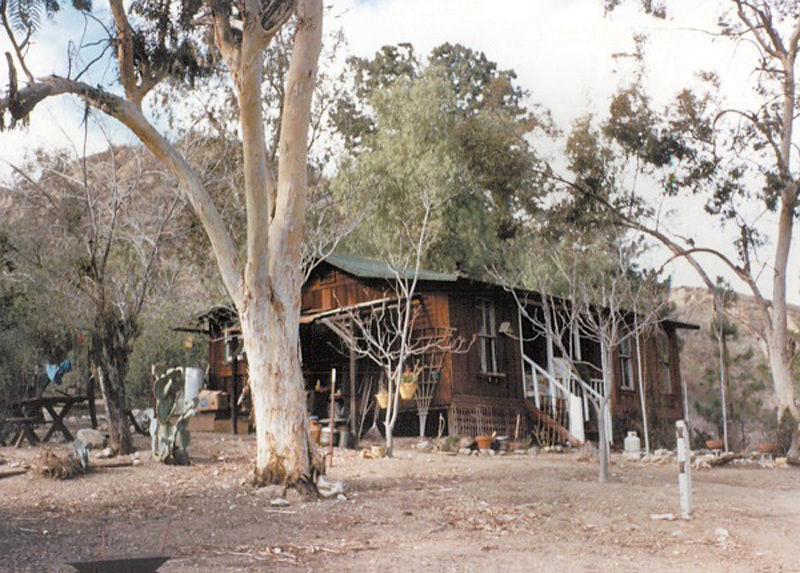 Gilmartin flipped the property in Spring 2001 to local teacher and historian Philip Scorza, and four months later, on Aug. 27, the 1962 cabin — Scorza's house — burned down when the 2,183-acre Castaic wildfire swept through the canyon. Scorza was at work at Canyon High School at the time; the cabin was partially obscured by shade trees, and firefighters mistook it for an outbuilding. Scorza built a new cabin on the site of the 1962 structure. A few dozen yards to the south stands the rock chimney from the original Winkler homestead cabin. Just to the south of that is the site of the future (as of 2013) Castaic High School. SG0923a: 9600 dpi jpeg from 200 dpi tiff | Collection of Marylynn Butters.